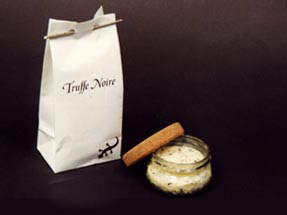 Drop a dollop of crème fraiche in the bottom of the ramekin, sprinkle grated truffle and break the eggs on top. Add salt and pepper. Cover the ramekin with either baking paper or with some puff pastry. Keep the preparation well sealed. Place in preheated oven at 160°C for 10 minutes. Serve immediately. This dish can be accompanied with slivers of bread that has been buttered with truffle butter.